You know the benefits, you want the body — you just can’t seem to find the motivation to get started. Being the new kid on the block at a gym can be intimidating, and adding an hour to your already hectic daily routine even more so. These 6 tips will help squash those doubts and set you on track to build a stronger, healthier version of yourself. Ultimately, YOU are the only one who has the power to make a change! How Empowering is that? Remember: You got this. Do you hit the snooze button seven times in the morning before opening your eyes? If hitting the gym before work just isn’t realistic, try an afternoon workout instead. Consistency is key for building a routine that will stick, so figuring out what time each day works best with your schedule at the beginning will set you up for success. Pair up with a friend who has similar fitness goals so you hold each other accountable for reaching them. Not only will you enjoy the social aspect of working out, but you’ll be a lot less likely to bail if someone else is counting on you. Plus, it just feels good to cheer on someone else! Personal training can be expensive, but there is a plethora of free or low-cost fitness apps that focus on fun, well-rounded workouts that will definitely make you sweat. Are you looking for a booty building workout? Toned arms for summer? The ever-elusive side abs? Then check out one of these apps: Nike Training Club (Free), Sworkit ($10 per month), Studio Tone it Up ($12.99 per month) or Sweat: Kayla Itsines Fitness ($19.99 per month). Take a trip to your favorite athletic wear store and spring for one new gym outfit that you’ll be confident rocking and excited to show off. Make a rule that you’ll only wear it at the gym, so you’ll have an extra boost of motivation to get yourself there. To keep up the momentum, try setting short- and long-term fitness goals and then rewarding yourself periodically with new gym clothes or accessories. Food is fuel, and if you put healthy meals in your body throughout the day you’ll have energy to continue taking care of it at the gym. If you opt for something along the lines of ground beef-stuffed bell pepper or zucchini noodle pasta with beet marinara for lunch, you’re going to feel a heck of a lot better than if you microwave a frozen meal or reach for a convenient, but not healthy, option. Nothing can strike a workout from your schedule faster than feeling exhausted. When all you can think about is how comfortable your bed is, the last thing you’ll want to do is put on your gym clothes and lift some weights or jump on a treadmill. Make sure you regularly get enough sleep (6-8 hours every night) to recharge your body and you will feel the spring return to your step. Creating a workout routine and sticking to it is always easier said than done, but by following these tips you can begin to motivate yourself to hit the gym. For more help, discover the 6 biggest reasons women can’t lose weight … and how to fix it. 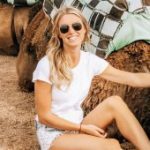 Emeri Callahan is a freelance travel, wellness and lifestyle writer who divides her time between San Diego, CA and San Juan, Puerto Rico. You can most likely find her planning her next trip or on the hunt for a veggie burrito.